It’s been a while since I stopped at the 3rd Street Gallery in Carnegie, PA to listen to the guys play jazz. 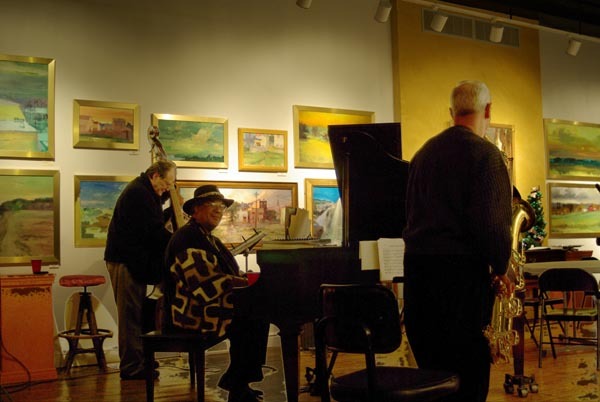 On bass is Phil Salvato, who owns the gallery; all the paintings you see in the photo are also his paintings. On piano is Haywood Vincent, improvisator extraordinaire with a huge repertoire, and on tenor sax is Ron Bissetti, former public school music teacher and long time jazz musician. A small group of us had a simply merry time in the gallery space, restored from a century of alternate uses including a hardware store, florist shop and pizza shop. Read more about the 3rd Street Gallery at www.3rdstreetgallery.net.